Whilst this case study provides only a summary of a single nuclear weapon detonation the conclusions are stark. The detonation of a 100kT warhead over Manchester would create blast and thermal effects killing more than 81,000 directly, leaving more than 212,000 injured, devastating housing and commercial buildings, destroying vital infrastructure, causing massive population displacement and leaving the local emergency service capacity seriously degraded. Ongoing radiation would have further health effects and hamper any efforts at remedial action. Even outside the zones of direct damage the effects of the detonation would leave systems of communication inoperable and the local population overwhelmed by those fleeing the crisis. The capacity of emergency and health services to provide a meaningful response would be minimal and the long-term impact on the psychological, social and economic fabric of UK society would be massive. The findings of this case study are not new. Rather it seeks to reinforce a basic understanding of the scale of humanitarian consequences that would result from any use of nuclear weapons. It is very narrow in its consideration of the humanitarian effects, and these in turn are conservatively drawn. The international humanitarian consequences of a nuclear war would be magnified many times from the impacts projected here, extending into environmental impacts that would affect populations far removed from the crisis. Yet by painting a more limited picture we are reminded, at a scale we can relate to, that the consequences of these weapons are far beyond what most people would consider acceptable. In a context where all other weapons of mass destruction have been prohibited, and a number of conventional weapons banned also, it is a legal anomaly that weapons that create such unacceptable effects have not yet been explicitly outlawed. This anomaly persists primarily because the participation of the states currently armed with nuclear weapons has so far been treated as necessary for a process establishing such a prohibition. Allowing the legal status of nuclear weapons to be dictated only by countries that wield them is a failure of the wider international community. Concerned states, in partnership with international organisations and civil society, should establish a legal prohibition on the use, production, stockpiling, transfer of nuclear weapons, and on assistance with such acts, regardless of the participation of the nuclear armed states. In the history of weapon prohibitions, it is normal for the change in legal status of the weapons to precede processes of stockpile elimination. In the case of nuclear weapons it is arguably necessary for such a change in legal status to occur as a spur to more serious policy revision amongst those states that continue to assert (in action if not in rhetoric) that nuclear weapons are a legitimate weapon for them to wield over human society. Those states that possess nuclear weapons will protest that a treaty prohibition on nuclear weapons, developed and concluded without them, lacks validity; but their protests will be evidence that they fear such an instrument and that it will bear upon them. The humanitarian consequences of nuclear weapon use, even when considered most conservatively, demand that such use be explicitly made illegal. It is against a background of international illegality that efforts to eliminate nuclear weapons will most productively be pursued. The report has been written by Article 36, in cooperation with Scientists for Global Responsibility. It is part of a series of new UK-focused studies on the humanitarian consequences of nuclear weapons that are being produced by members of the UK arm of the International Campaign to Abolish Nuclear Weapons. These reports will be released in advance of a major international conference hosted by the government of Norway on 4-5 March to consider the humanitarian consequences of the use of nuclear weapons. So far 120 countries have registered to attend, including national authorities responsible for humanitarian response to the impact of a nuclear weapon detonation. The UK has not officially confirmed whether it will participate in Oslo. Immediately preceding this conference, Oslo will also see the largest gathering of civil society on nuclear weapons in recent years, with over 700 participants from around 90 countries registered to attend a civil society forum hosted by the International Campaign to Abolish Nuclear Weapons and aiming to develop a common strategy towards a new international treaty prohibiting nuclear weapons. The reports will be launched at an event in Committee Room 5 in Parliament at 5:30pm on Tuesday 26 February, hosted by former Minister for the Armed Forces, Nick Harvey MP. 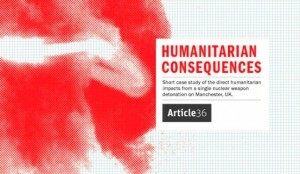 Article 36 is a UK-based NGO established in 2011 to undertake research and advocacy on the humanitarian impact of certain types of weapons and methods of warfare. Article 36 is a member of ICAN UK and serves on the leadership body of ICAN internationally.